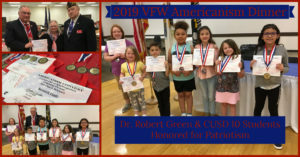 Collinsville VFW Post 5691 presented their annual Americanism Contest Awards on Tuesday, April 16, 2019. Students from CUSD 10 elementary schools, as well as SS. Peter & Paul, Holy Cross and Good Shepherd were honored. VFW Americanism Contest Co-chair Mrs. Kathy Conn said over 640 entries were received. Awards were presented to the top three entries in each category from preschool thru 5th grade. Contest winners, their families and special guests enjoyed dinner before the award presentation hosted by Mr. James Conn. The featured speaker was retiring CUSD 10 Superintendent Dr. Robert Green. Green thanked the VFW for their leadership in teaching patriotism to today’s students. He talked about how his father and father-in-law were among those who served in WWII, paving the way for future generations to achieve the American dream. Dr. Green spoke about his experiences as a history teacher and the importance of honoring those who sacrifice to keep our country free. Mr. and Mrs. Conn presented a special medal and certificate to Dr. Green for his support of the Americanism Contest and dedication to teaching patriotism. 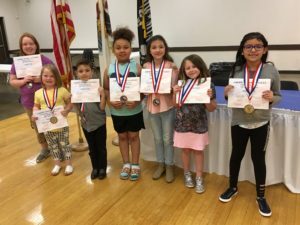 Preschool and kindergarten aged children entered a coloring contest; first, second and third graders participated in a poster contest; grades four and five wrote essays with the theme, “Why I Love America.” Each child who earned a place in the top three, were given a certificate and medal.